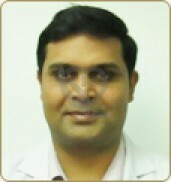 Dr. Vishal Sharma, MBBS, DNB(Respiratory Medicine), is a Consultant Pulmonolgist at Alchemist Hospital, Panchkula. Dr. Sharma is an alumnus of Government Medical College, Jammu, from where he completed his basic medical studies, M.B.B.S. Thereafter, he went on to world renowned Institute, Sir Ganga Ram Hospital, New Delhi to pursue with post graduation- DNB (Respiratory Medicine). Besides, he holds an European Diploma in Adult respiratory medicine from Lausanne University, Switzerland. He has undergone thoracoscopy training under Prof. Philippe Astoul, Head Of Thoracic Oncology, Pleural Disease and Interventional Pneumology, Hospital Nord in Marseille France. To his credits, he is among the first few Indian Pulmonologists to be trained and having experience in Endobronchial ultrasound- a new diagnostic modality for diagnosing the pathology of abnormal mediastinal lymph nodes & lung malignancy. Dr. Sharma has attended many national & international conferences and was awarded the European Diploma in Adult Respiratory Medicine at Annual Congress of European Respiratory Society in Barcelona (Spain) in 2013. Doctors like Mr vishal sharma gives hope of ray to the patient to fight d disease nd live healthy. Excellent experience with Dr Vishal.